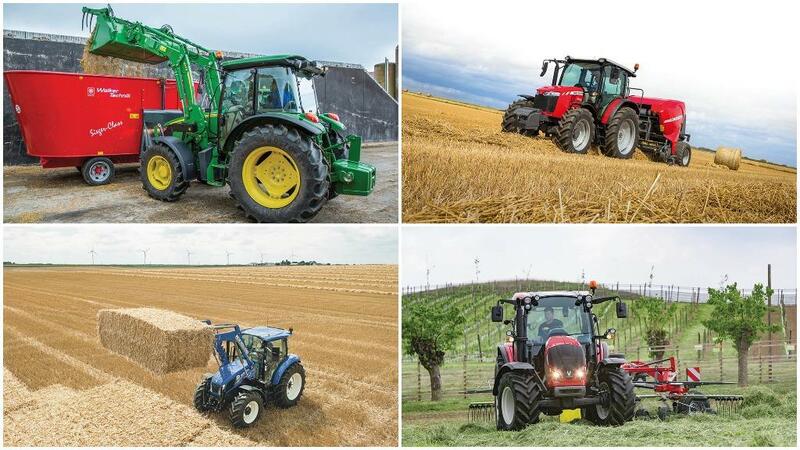 Whether you want to tread lightly on less strenuous fieldwork, or carry out all manner of tasks on a livestock farm, sub-100hp tractors have a wide and varied level of specification. Richard Bradley takes a look through the latest offering. Having already revamped its top-spec 5R Series, the Manheim-based manufacturer set about updating its mid and entry level 5M and 5E Series. Starting out the offering, the 5E offers four models from 49 to 75hp from a 2.9-litre, three cylinder diesel engine, which couples to a 12 by 12 power shuttle transmission as standard, with the option of a 24 by 12 transmission with 40kph top speed. Inside the cab, electronic controlled rear linkage is now featured, and an air suspended seat is available to improve comfort. Sitting above the 5E, Deere’s 5M features a higher spec level, and offers power ratings from 75hp using the same 2.9-litre three cylinder engine, with three larger models benefiting from a 4.5-litre four-cylinder JD engine offering power levels up to 115hp. Transmission options include a 16 by 16 or 32 by 16 ‘box, all of which feature a power shuttle. Available in open, standard or premium cab formats, the 5M now features an air seat and transmission declutch button on the gear lever as standard. At the rear, an open-centre hydraulic system offers up to 94l/min of oil flow, and the rear linkage can now lift up to 4,300kg. Retail prices for the smallest 5050E model start from £31,407, with largest 5075E from £41,412. For comparison, the 5075M costs £44,336. Now into its fourth generation, Valtra’s A Series range now comprises seven models across three separate chassis sizes. Produced at its factory in Finland, it gets plenty of Finish flare with handy features and a well laid out cab. The three smallest models feature a three-cylinder, 3.3-litre engine offering 75 to 95hp ratings, while larger framed models feature a 4.4-litre, four cylinder engine and offer power ratings of 100 to 130hp. All models feature a 12 by 12, six speed transmission offering a 40kph top speed, de-clutch button and brake to neutral function as standard. Inside the cab, an engine speed memory can be set and an armrest-mounted joystick is fitted to loader-ready machines. 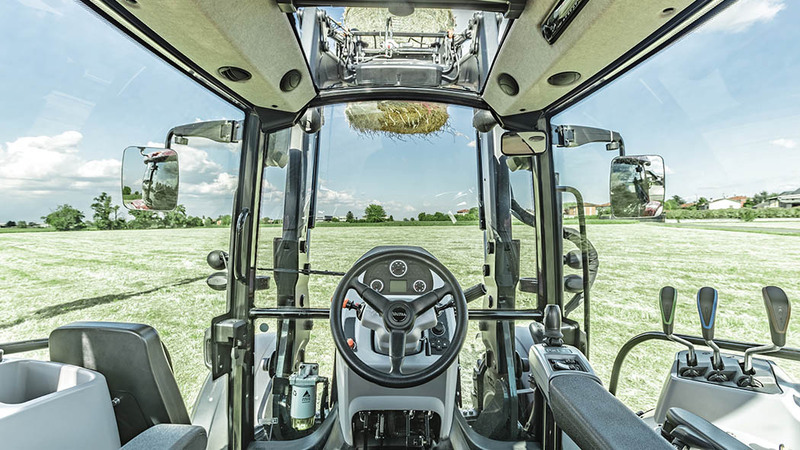 A panoramic sunroof can also be fitted for improved views of the loader. Rear linkage offers a 3,000kg lift capacity and up to three spools can be fitted at the rear, with maximum oil flow of 65l/min. Retail prices start from about £45,000 for the smallest A74 model. 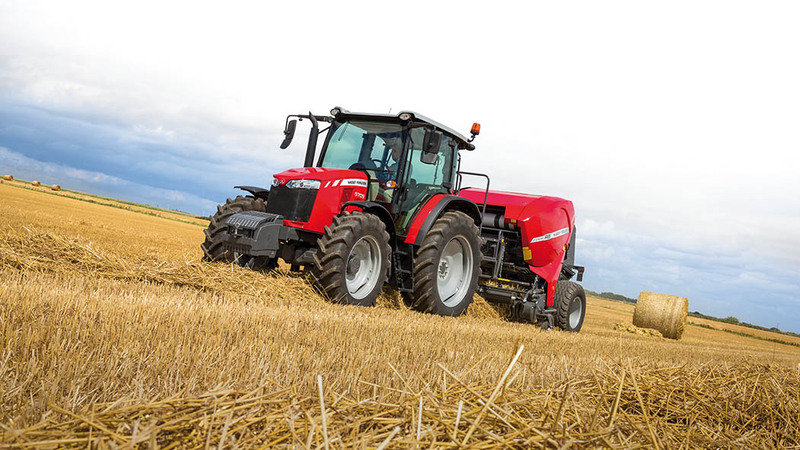 For those looking for something a little more advanced, Massey Ferguson has bolstered its Global Series lineup with the addition of two new higher specced models. 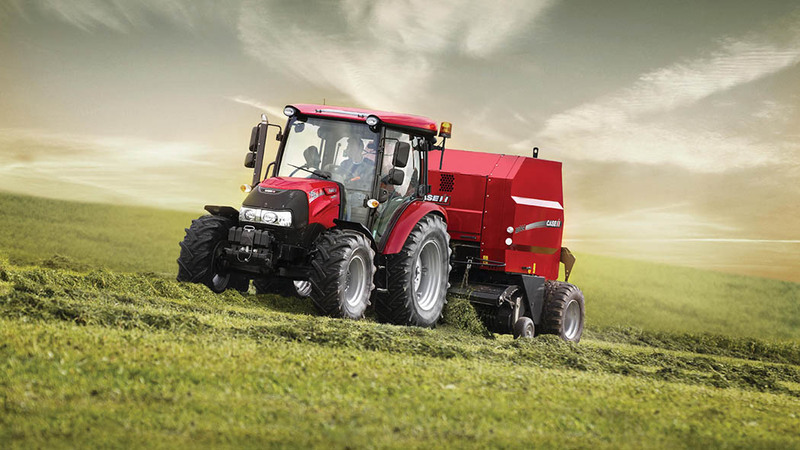 Combining the larger chassis of MF’s 5700 with the 3.3-litre, three cylinder Agco Power engine from its 4700 Global Series, the new 5708 and 5709 models offer power ratings of 85hp and 95hp respectively. Coupled to the engine is the firm’s renowned Dyna-4 semi-powershift transmission, offering 16 by 16 speeds thanks to four powershift steps in each of the four ranges. Both speeds and ranges can be shifted without using the clutch via the right-hand T-bar, and speeds can be shifted with the firm’s Power Control shuttle lever. 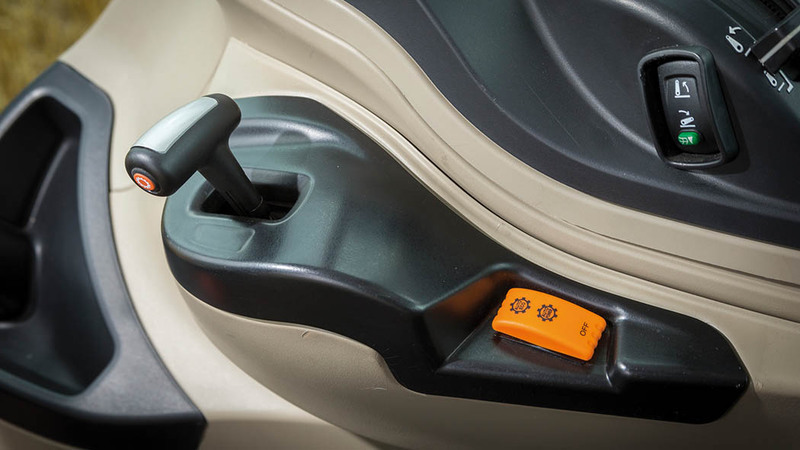 Available as an option, AutoDrive offers automatic shifting of speeds. Thanks to the 5700 chassis, the new models can lift up to 4,300kg at the rear linkage, with a 58l/min auxiliary oil pump fitted as standard. This can be upgraded to a twin-pump arrangement, offering up to 100l/min flow for more demanding work, such as with a loader or hydraulically-driven implement. As an entry level option to the firm’s highly-specced T5 Electro Command, New Holland has launched the T5 Utility. The T5 Utility is available in five models from 75 to 114hp, with power provided by a 3.4-litre FPT engine, boasting two speed memory functions. Transmission options include a 12 by 12 synchromesh shuttle or 12 by 12 with power shuttle on the smallest T5.75 and T5.85 models, while three larger models boast CNH’s 24 by 24 Dual Command transmission with a hi-low splitter. For simplicity or greater comfort, open canopy or fully cabbed models are available, as is two- or four-wheel drive, and the firm’s SuperSteer front axle can be fitted to offer up to 76 degrees steering angle. 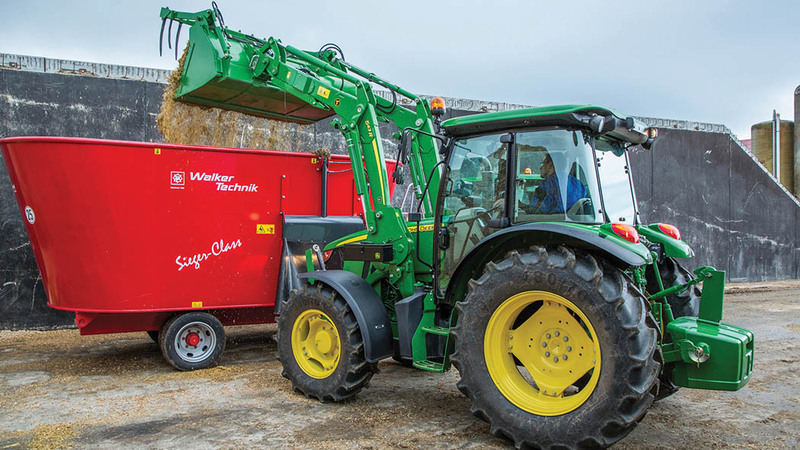 Again with simplicity in mind, the 4,400kg capacity rear linkage uses mechanical draft control as standard, with the option of electronic control on Dual Command equipped tractors. 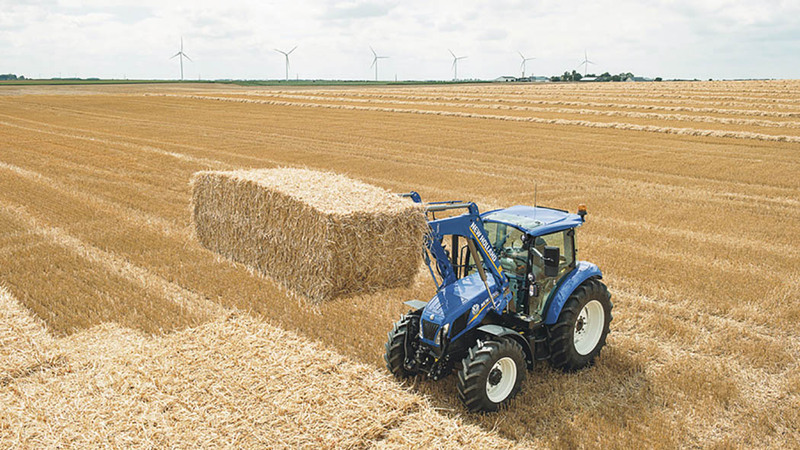 New Holland’s 500TL and 700TL front loaders can be fitted from the factory, and a 1,670kg front linkage and 1,000rpm pto are also on the options list. Retail price for a T5.75 with open canopy and 2wd starts from £29,854. 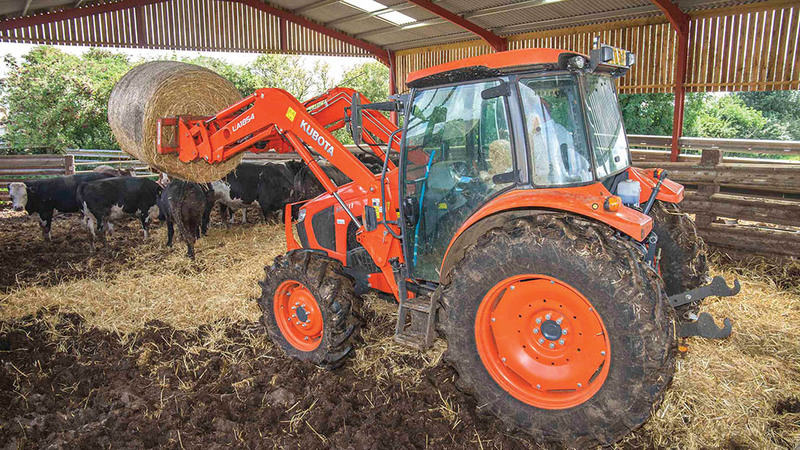 Replacing the existing M8560, Kubota launched its M5001 Series tractors. Comprising two models the M5091 and M5111, the M5 range offers power levels of 95hp and 113hp from Kubota’s own 3.7-litre four-cylinder engine, albeit with revised power and torque curves to provide more low-down grunt, according to the firm. Thanks to a three range, six speed transmission with a splitter, 36 gears are available in forward and reverse offering 40kph top speed. A de-clutch button is standard fitment, and a new electro-hydraulic power shuttle is located on the steering column. At the rear, up to 4,100kg can be lifted by the mechanical daft controlled linkage, and up to 64l/min oil flow is available, with the option to fit up to four spools. Updates continue into the cab, which is now 180mm wider allowing an instructors seat to be fitted. A new LCD dashboard is fitted to display all working information, and an air-suspended seat, air conditioning and a sunroof all come in the standard specification. Control layout has been revised too. Costing £41,500, the smallest M5091 can be factory fitted with a loader. 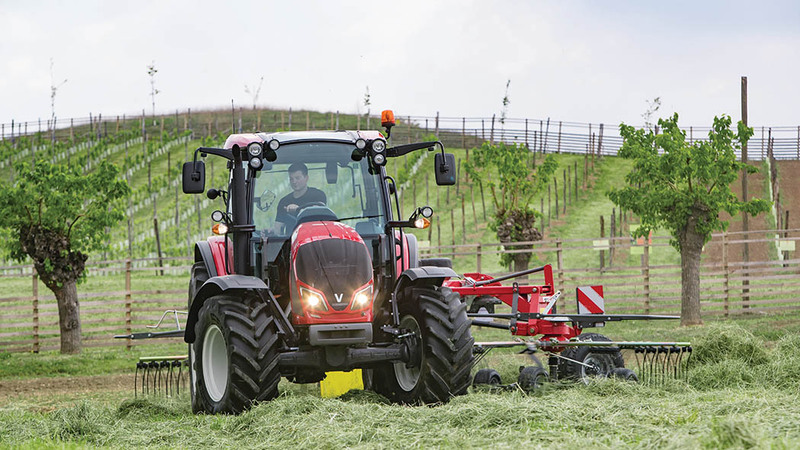 Sitting below the Major, Zetor has added two new entry-level ranges to its tractor portfolio. Alongside the two model Utilix range, the larger Hortus adds two further models to the firm’s portfolio. Available in CL specification with mechanical shuttle, or HS with power shuttle, both models boast a 12 by 12 speed transmission with a top speed of 40kph and creeper gear as standard. Power is provided by a 2.9-litre, four cylinder Deutz engine, with 67hp on tap. A dedicated hydraulic pump for the rear and loader offers 39l/min flow, and up to four spool valves can be fitted. Featuring mechanical control, the rear linkage can lift up to 1,900kg, and a three-speed pto is standard fitment. Standard fitment also includes a sealed cab with air-conditioning, and a mechanical joystick is fitted for use with a front loader. Alongside its current 85-115hp Farmall A tractors, Case IH has added three smaller models to its range. Unlike its larger four-potter siblings, the FPT motor in the three models is a 2.9-litre three cylinder unit, offering 55 to 75hp. Available in two- or four-wheel drive configuration, standard transmission on 2wd machines is a 30kph, 12 by 12 speed with mechanical shuttle, while 4wd models benefiting from a 40kph transmission. Creeper gear and power shuttle are both available as options. As standard, rear linkage lift capacity is 2,700kg, with the option of fitting an assister ram to lift up to 3,000kg; control is mechanical. Hydraulic flow to the three rear spool valves is provided by a 48l/min pump, and a 540 speed pto comes as standard, with the option of 540/540E or 540/1,000 speeds. A four-post sealed cab also comes as standard, with the option of upgrading the standard blowers to air conditioning. Front linkage a loaders can also be fitted as options. Retail price for the Farmall A Series starts from £20,401 for a 2wd A55. 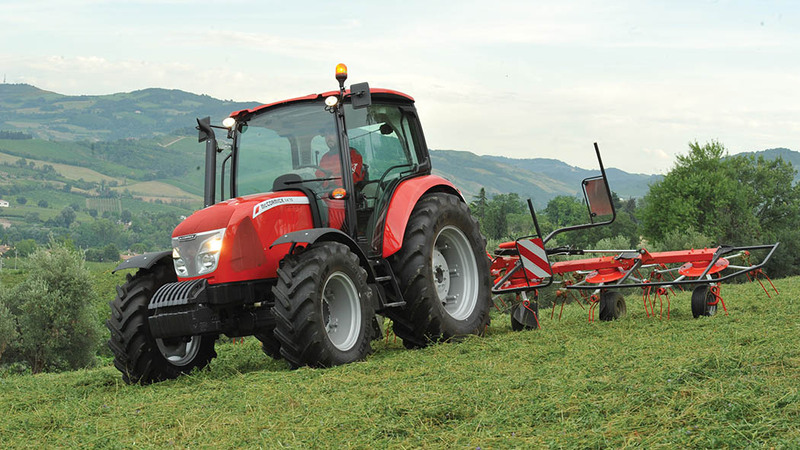 Comprising six models across two chassis sizes, McCormick’s X4 range is available with power ratings of 69 to 107hp. And, it is the three larger chassis models, offering 90 to 107hp, which have been updated to meet Stage 4 engine emission regulations. Power is provided by a 3.6-litre, four-cylinder Deutz engine, with a plethora of transmission options to suit user requirements. As standard, a 12 by 12 speed mechanical shuttle is fitted, with the option of fitting a creeper gear or a splitter on 4wd models to offer 40kph top speed. All of the above can be upgraded to a power shuttle transmission for more convenient use. At the rear, up to 3,900kg can be lifted with mechanical or electric control available, and the standard 44l/min oil pump can be upgraded to a 57l/min system. Two-speed rear pto now also features electro-hydraulic engagement, rather than previous mechanical system. A four-post cab or roll over frame can be fitted, with the latter featuring heavy-duty rubber flooring to ease hosing down. 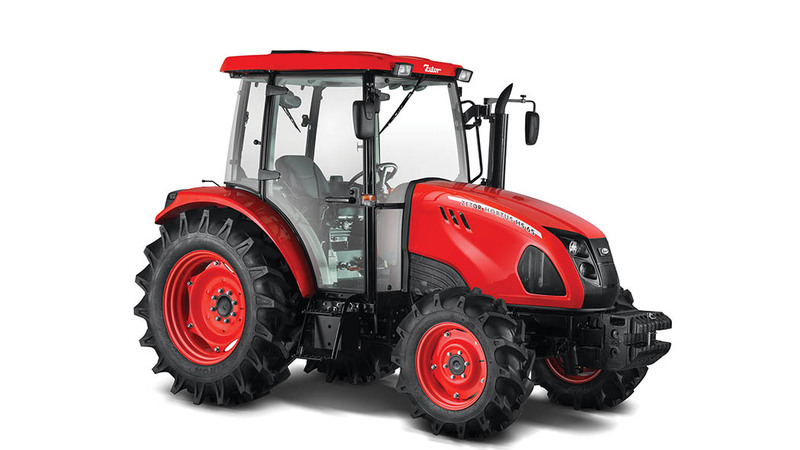 For those seeking an even more basic, entry level tractor, McCormick also offers the X4M Series.